on it, becoming a hot topic. On the 12th January, Kim Jaejoong updated his twitter with a photo of a bread wrapper, accompanied by the words “Seems like I’ve made bread”. 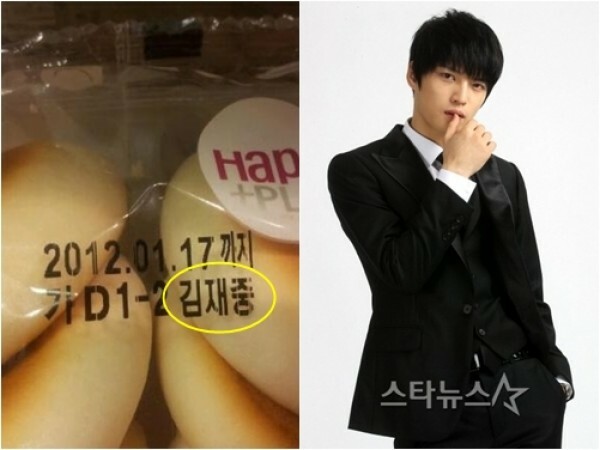 The bread wrapper that Kim Jaejoong revealed attracted the attention of people as it had the name “Kim Jaejoong” printed on it, along with the expiry date “Best Before 2012.01.17″. In response to this, netizens wrote, “Since when was oppa involved in a bread business”, ” I’ll have to look carefully the next time I eat bread”, “Laughing since the morning” and “Oppa is so witty as expected”, among other responses. On another note, Kim Jaejoong’s group JYJ will be performing in Chile and Peru on 9 and 11 March respectively. They will be the first South Korean singers to hold concerts in South America. This entry was posted in Achievements, Culinary Arts, Features and Stories, Jaejoong's Twitter, JYJ, Kim Jaejoong, Momma's Boys, Spazzini, Translation, Twitpics and tagged bread, Chile, concert, Culinary Arts, entrepreneur, Jaejoong, JYJ Live, Peru, photo by chaelwest. Bookmark the permalink.